This new shingle home is a combination of modern elements with earthy country comforts. The project started with construction consultation on an existing set of builders plans with adjustments to layout and some additions. 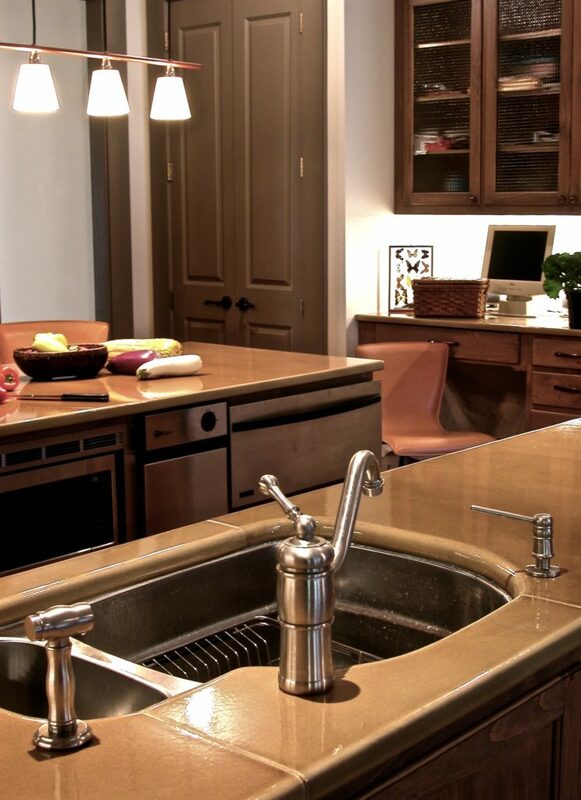 It continued through bath design, finishes, material selection and finally furnishing. 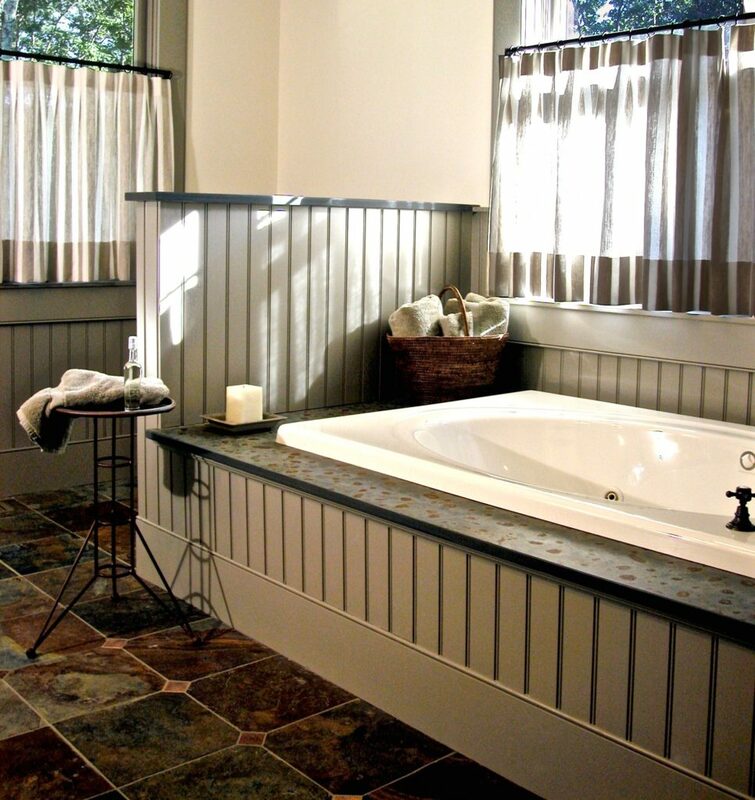 Deeply painted flat plank woodwork against white walls bridges country and contemporary in it’s simplicity. 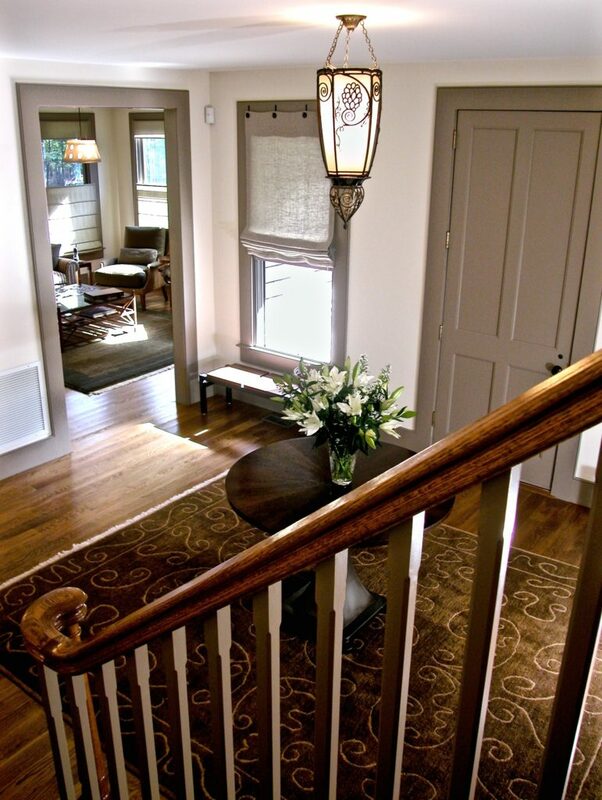 The view from the stairwell looks down into the entry with it’s antique lighting fixture, contemporary table and rug. 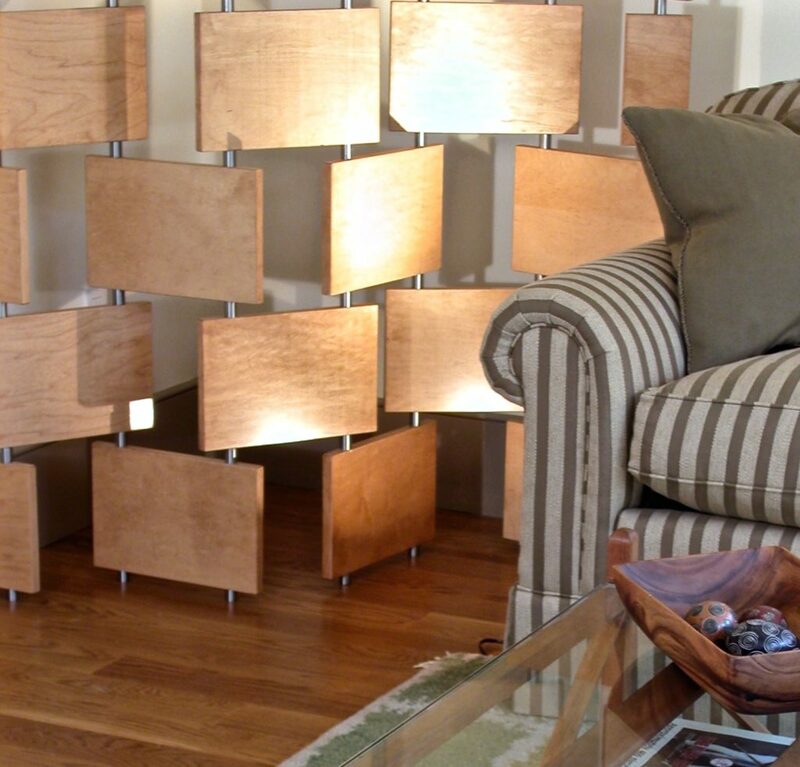 A view through the entry to the den is highlighted by a lit contemporary wood screen. The earthy color palette of the entry flows into the den with its pair of natural woven chairs and Vintage 1950’s curvilinear wood side table. 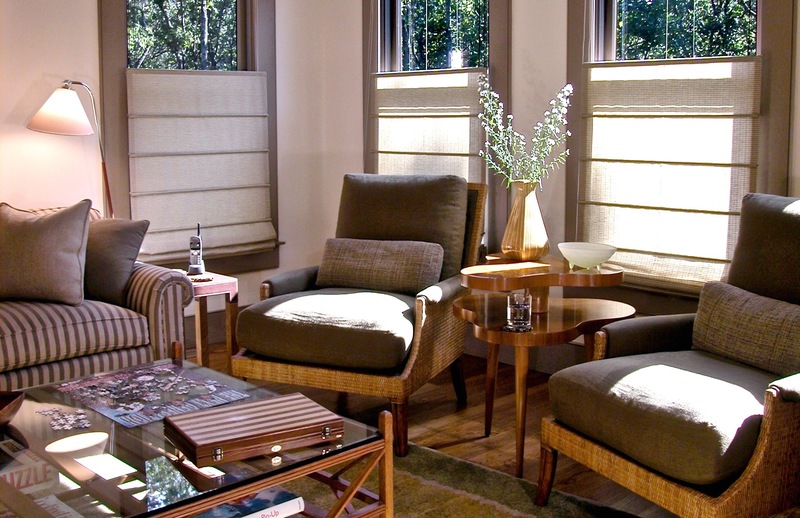 A contemporary light fixture shines over an “architects” wood and glass coffee table and country style sofa. 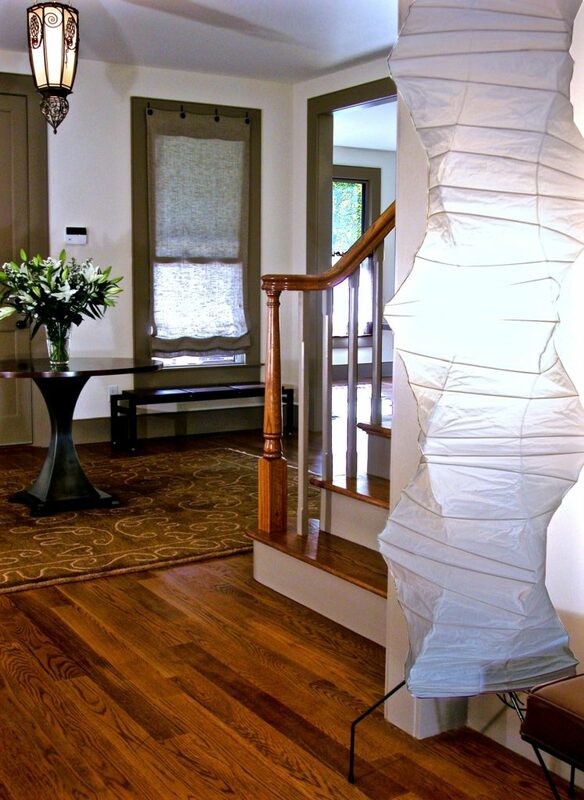 The entry to the Living Room is highlighted by a Noguchi standing lamp. 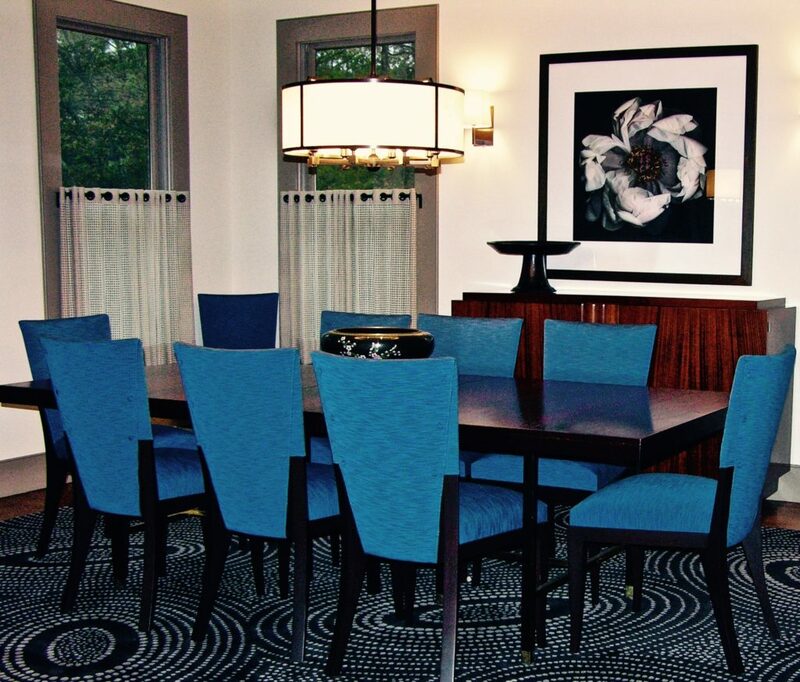 In the Dining Room, sheer textured linen cafe curtains are hung on oil rubbed bronze rods and grommets. The cafes give privacy while leaving sky and foliage views. 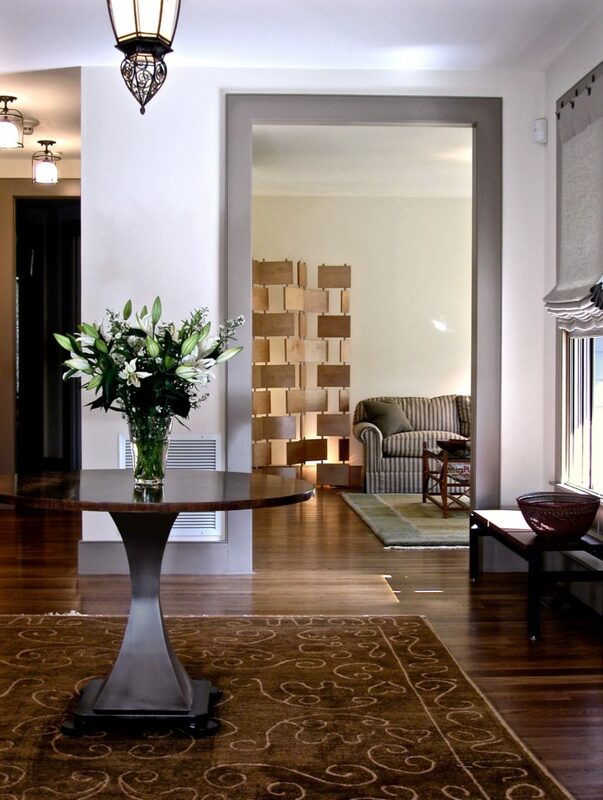 A vintage cabinet and dining table are combined with a contemporary custom designed rug. 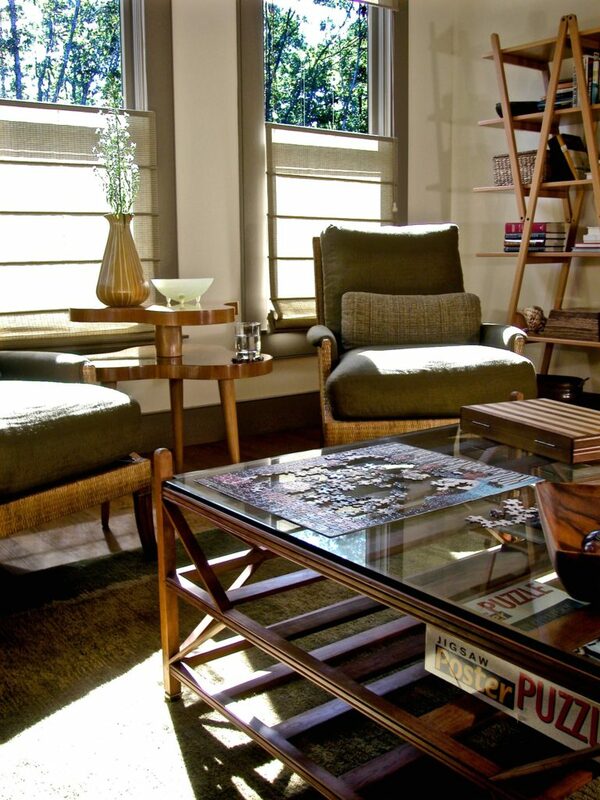 Clean lined upholstered chairs add color to the brown and cream pattern of the rug. 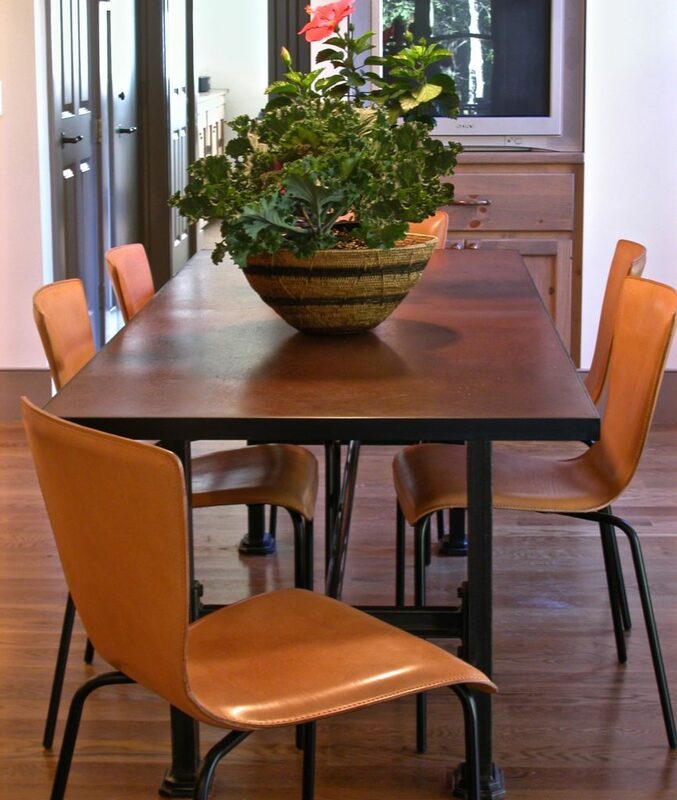 In the kitchen traditional country cabinets meet an industrial steel table in rust and black finishes and contemporary leather chairs. 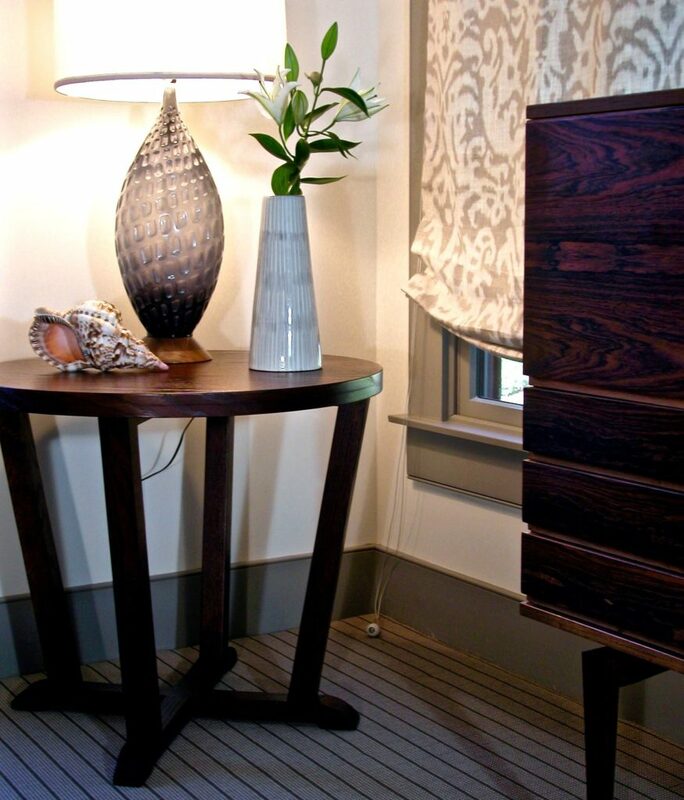 In the Master Bedroom a vintage glass desk lamp sits on a leather desk. The mirror above reflects the modern linen webbed headboard and contemporary wood lamps. 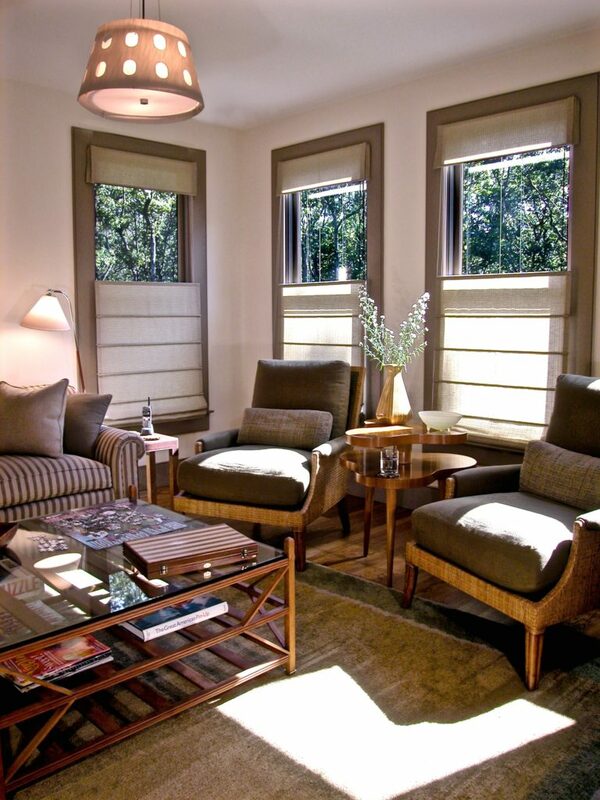 A vintage modern cabinet sits between windows with patterned linen shades. 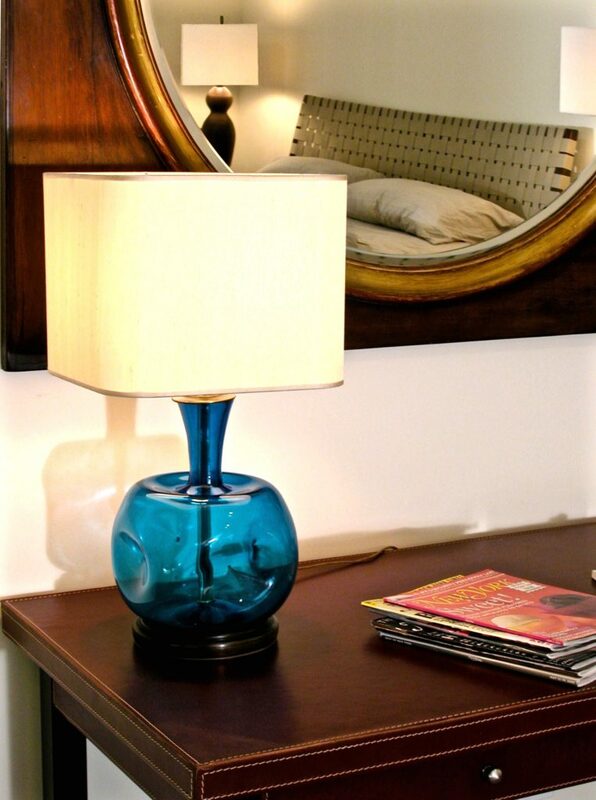 A contemporary wood table holds another vintage glass lamp. 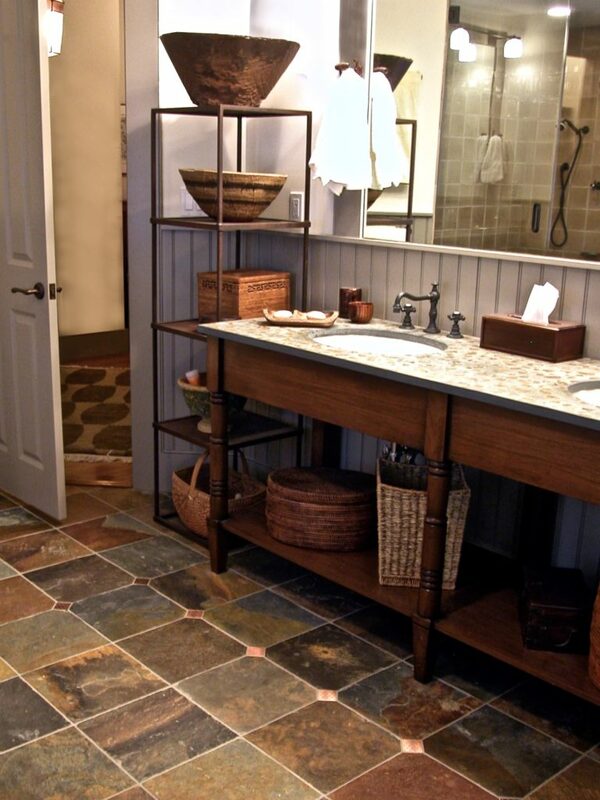 The Master Bath is all earthy warmth with its country wainscoting and mix of vibrant slate tile and copper accents. 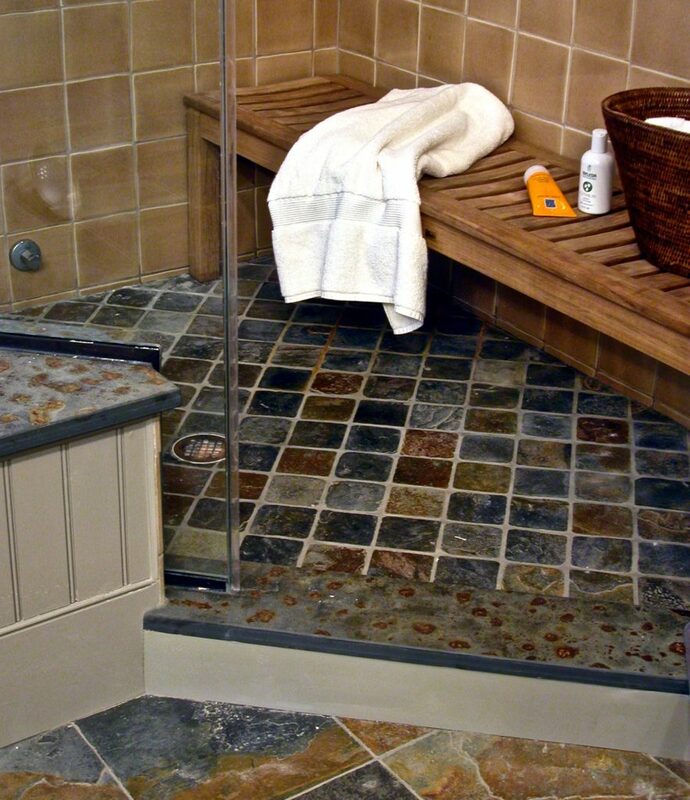 A teak bench in the glass shower adds warmth and comfort while the multi toned slate floor tile continues in a smaller scale. 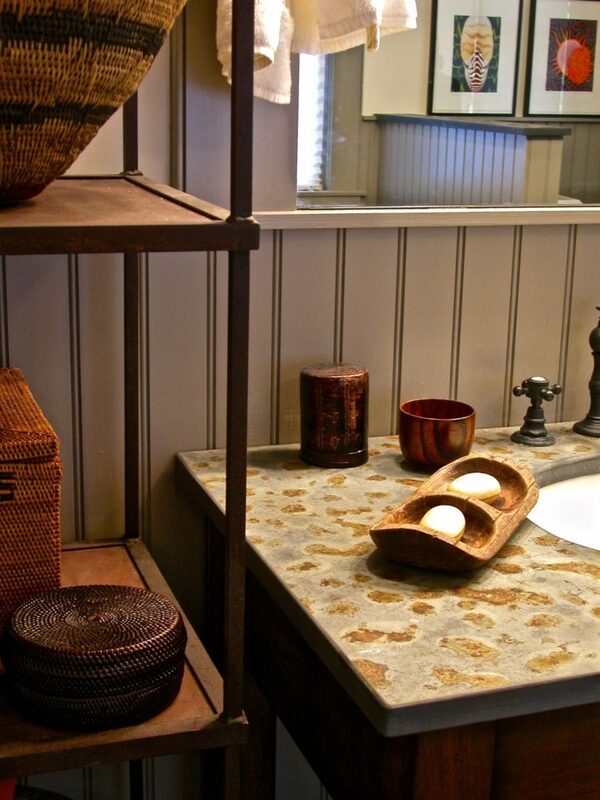 Slate slabs are used around the tub and on the custom designed wood vanity. Basket storage on the steel & wood shelving unit is both functional and beautiful. We would love to hear from you. Please feel free to leave a comment with your contact information on the form above. We will respond as soon as possible. The best way to reach Cj is via email or by leaving a voice message.